A large percentage of our equine practice is spent diagnosing and treating lame horses. Proper hoof care and farriery is a vital part of the treatment plan and future performance of your horse. If the horse’s feet are not balanced, trimmed and shod properly, any other medical, surgical, non-invasive, regenerative or alternative therapy will not be effective. We have a very good working relationship with very competent farriers. This is essential for successful outcomes and welfare of your horse. Equine Laminitis is the #2 killer of horses every year. Laminitis is a disease process involving the horse’s foot. The disease involves a breakdown of the bond between the hoof wall and the distal phalanx (coffin) bone. This hoof wall bond is the only thing that prevents the horse’s body weight from forcing the coffin bone through the bottom of the hoof. This bond must be strong enough to sustain the forces applied to it when the horse is running and dynamic enough to allow the hoof to grow and wear off or be trimmed when needed. 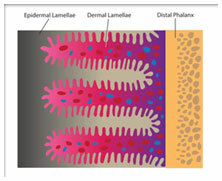 To achieve the strength necessary to withstand these forces, the dermal-epidermal interface (hoof to bone connection) consists of several hundred folded lamellae (often referred to as lamina). The surface of each lamina is folded into many smaller secondary laminas which further increases the surface area and strength of the bond. This dermal-epidermal lamina is in essence cemented together by a thin layer of extracellular material called the basement membrane. The destruction and subsequent failure of this membrane is one of the fundamental events to occur in the development of laminitis. There is a long list of insults that can precipitate the development of laminitis in the horse and regardless of the cause, the end result is the same. The hoof wall / coffin bone bond is compromised either by protein degrading enzymes, interruption of blood supply or interference with glucose metabolism which results in detachment of the basement membrane. Whatever the cause, when the bond is broken, the hoof wall and coffin bone separate and displace under several forces including; the horses weight, the deep digital flexor tendon pulling on the coffin bone, and stress on the front of the hoof wall from contact with the ground. Usually the bond is most severely compromised on the front of the foot which rotates the coffin bone downward within the hoof capsule forcing the tip of the coffin bone into the dermis of the sole compromising the blood supply to that area. A more severe scenario is seen when the entire coffin bone separates and drops within the hoof capsule, this condition is called “sinking” and usually has a much graver prognosis for recovery. Severe Laminitis is an extremely painful condition due to the abundant supply of sensory nerve endings in the dermis of the foot. The inability to manage the extreme pain in severe cases of laminitis is the main reason for humane euthanasia in these cases. Laminitic cases vary in severity from mild to loss of the entire hoof capsule and death. Diagnosis of Laminitis is based on clinical signs, history, and radiography. The laminitic horse is usually very painful, lame, reluctant to move, may rock back on his hind legs to relieve pressure on the front feet and will usually have an increased (bounding) pulse in the digital arteries to the foot (best detected at the level of the seasmiod bones at the fetlock joint). Radiographic changes vary with severity and chronicity and range from widening of the lamminar zone, fluid lines, rotation and displacement of the coffin bone, bone lysis and abscessation. A contrast venogram of the foot, where radiopaque dye is injected into the blood vessels of the foot is a very valuable tool to access the integrity of the circulation within the hoof capsule. Treatment involves appropriate medical, possibly surgical, intensive anti-inflammatory and pain medication, and proper hoof care and stabilization of the foot. Acute Laminitis is considered a medical emergency and therapy should be started immediately. It is important to know that once signs of lameness are noticed there is already insult and damage occurring to the hoof bone bond. The idea of aggressive therapy is to stop further insult, reduce inflammation and stabilize the hoof capsule /coffin bone to promote heeling and development of chronic laminitis. The patient is treated with anti-inflammatory and anti-endotoxic drugs (@Banamine, Butazolidin), Cryotherapy (Standing in an ice water bath up to the knees for 48-72 hrs. has proven to be very effective initially), Low doses of Acepromaxine given every 3-4hrs., stabilizing the foot, relieving pressure over the toe of the painful coffin bone, and relieving pulling tension of the deep digital flexor tendon by standing in soft sand or elevating the heel of the foot is extremely important. This where my ROCKER RAIL SHOE has saved many horses that previously may have had to be humanely euthanized. Is a self-adjusting Rocker Rail shoe that de-rotates the coffin bone and allows the horse to find their own comfort zone. The evolution of this shoe began in 2003 and actually started with a wooden shoe much like the one being marketed today to treat laminitis. I was making and using these wooden shoes and the cases were responding well, but in my hands they were time consuming, required some carpentry skills and some material failures were encountered. You also had to remove the shoe to get to the sole to medicate or treat abscesses. Being less time consuming to apply: This mono-block horse shoe can be applied by nailing , glue-on-acrylics with fiberglass or glued on with an easy to use side clip system. Offer better wear resistance- with the aluminum alloy we use, one set of shoes will last 8mos. Provide a system of heel wedges that are easy to apply and will effectively elevate the heel to relieve tension on the deep digital flexor tendon. Shoe break-over: When I first started making these shoes I set the shoe’s break-over to a perpendicular line corresponding to the anterior border of the coffin bone as determined from lateral radiographs and centered the shoe over a perpendicular line to the center of articulation of the coffin joint as determined from a measurement taken from lateral digital radiographs (I have found this measurement to be approximately 1” behind the true point of the frog). On observation of shoe wear at 4wk. re-checks, the shoe had worn, moving the shoes break-over back to the center of the foot. The horses were much happier. I now manufacture these shoes with the break-over at the center of the shoe and set the shoe with break-over 1” behind the true point of the frog. Determining Heel Elevation to Relieve Tension on Deep Flexor tendon: Because the break-over on this shoe begins at the mid-point of the shoe, once the shoe is applied to the foot it allows the horse a very wide range of motion to rock forward, elevate the heel and relieve any uncomfortable tension on the deep flexor tendon. I simply let the horse stand on a hard surface and let him tell me where he’s comfortable, measure the distance he elevates his heels off the ground at the back of the shoe, pick a plastic wedge to match the measurement and screw it on. What are we trying to accomplish when shoeing the laminitic foot? Decrease tension of the Deep Digital Flexor Tendon: The horseshoes break-over and custom heel wedge system easily accomplishes this. Unload tension on the lamellar surface: The De-rotation trim and solid bearing surface of the shoe unloads the tension. Ease the foot’s Break-over: Through observation, the horse told me he was most comfortable with the break-over starting in the center of the shoe. Protect the sensitive tissue, esp. the sole over the anterior border of the coffin bone: The cut out area on the front half of the shoe eliminates any sole pressure in this area. Provide support to the bony column of the foot: The mono-block design and large surface area of the back half of the shoe supports the frog and bony column very well. 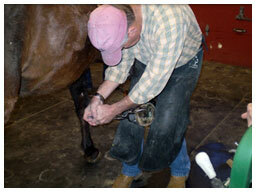 Currently, I am only selling this system to licensed Veterinarians with good working farrier relationships. I chose to market in this manner because LAMINITIS is a very complex disease process that requires constant monitoring, medical knowledge of the disease process, anatomy and foot bio-mechanics, and farriery skills. 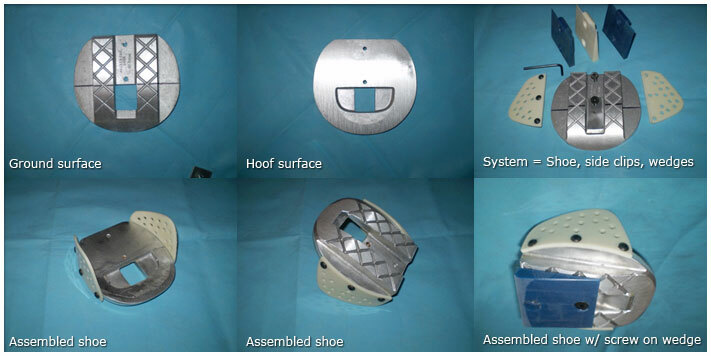 This shoeing system should only be applied with aid of good quality radiographs and venograms for the best outcome. There is no panacea or magical wand for curing Laminitis. There are dozens of different shoeing devices on the market, all with their own claim to fame. We must never forget, however; no appliance, device or tool is any better than the hands that apply it. The developmental period for my horse shoe has spanned a period of 8 years and is not finished yet. There is so much we don’t yet know about this horrific disease process and so much more we need to learn. This much I Do Know: In my hands, those of close colleagues, and the farriers I work with, we have had excellent success. We have returned many laminitic hoses to their previous discipline and have saved many very severe cases from being destroyed. The de-rotational trim: Trimming a laminitis foot with rotation of the coffin bone is best accomplished with the aid of radiographs. To be precise when trimming, I need a Lateral and A/P (anterior to posterior) view. It is very important not to remove any sole from the frog forward; the goal is to relieve all sole pressure over the anterior border of the coffin bone. This aids in restoring compromised circulation and new sole growth. I determine where to begin the trim anteriorly from the lateral x-ray. Measure the sole thickness from back to front; determine the most anterior point where the sole depth is 20mm’s and start the trim at this point and work toward the heels, trimming the heels as low as possible. I take another lateral x-ray to be certain the trimmed portion of the foot has anatomically aligned with the solar border of the coffin bone and make any necessary adjustments. Note: In Some cases of laminitis with severe rotation of the coffin bone I cannot trim the heels low enough to correctly align the coffin bone with the sole. These cases require the use a reverse wedge between the foot and shoe for alignment. The shoe is placed on the trimmed foot aligning the midpoint of the shoe (start of break-over) 1” behind the true point of the frog or to be more accurate, a distance determined from the lateral x-ray, a perpendicular line from the center of articulation of the coffin joint to the sole. The shoe is adjusted for medial /lateral symmetry and a SHARPIE marker is used to trace the hoof outline to the shoe. The marked shoe is then ground, sanded, or band-sawed to the mark for a perfect fit. If the hoof wall has good integrity, I will simply drill nail holes in the shoe and attach with horseshoe nails. The shoe can be attached with acrylic adhesive mixed with shredded fiberglass and fiberglass tape. I prefer Equilox or Grand Circuits Pro-fast acrylic. I now use plastic or aluminum side clips that screw onto the shoe, the clips are perforated. The shoe is held in place by an assistant and acrylic adhesive is injected into the hole in the clips until it protrudes from the clip. The shoe is held in place until the acrylic sets (approx…2 minutes) and is then returned to the ground. When I have everything organized for gluing, I mix dental impression material and pack the sole of the foot from the frog back, set the shoe and glue it. Note: Don’t use too much impression material; keep the heel of the shoe tight to the trimmed heels while the acrylic is setting. Let the horse stand on a hard flat surface and find his comfort zone by rocking up on his toe to relieve any tension on his tendon. Measure the distance from the ground surface to bottom of the shoes rail and apply a plastic wedge the same thickness as the measurement. Don’t forget to insert the aluminum cover plate over the treatment area before screwing on the wedge. If the horse in still uncomfortable in 24 hrs. remove the wedge and re-adjust the distance from bottom of the show at the heel to the ground. Monitor comfort level, pain, heat in the foot and coronary band, digital pulses, appetite and general attitude. I reset the shoes every 4 -5 weeks and make adjustments as needed.